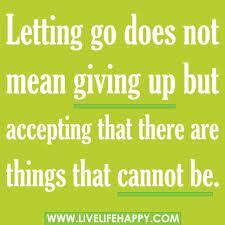 Letting go or walking away is not always giving up! There will be times in Life when you can’t do anything about a situation or a person, or both! You will feel incapacitated, even helpless. You will want to give up. Instead give in. Sometimes, a good way to make peace with a situation or a person is to give in, to let go, to walk away. But do it with grace, giving the person or the situation all your love and understanding. Do it peacefully. Without malice, without prejudice, without feeling frustrated. So two different, and at the same time, unique scenarios. One was in the context of being infirm and incapable of performing and leading anymore. Another was in the context of not wanting to come in the way of someone experiencing peace. Yet both were acts of letting go and walking away. To be sure, there may be a temptation to view these as acts of giving up. Perhaps a third anecdote may help clarify the essence of this learning better. Indeed. Trying to prove a point at the cost of your peace of mind is simply not worth it. Most often in Life, we don’t grieve over the injustice meted out to us by someone or a system or a situation. Our grief often comes from the fact that we have been taken for granted. That we have been pissed on, trampled upon and passed over. The hurt from having been used causes far more suffering than for having been abused. It is to avenge the ignominy of the treatment that we either fight or give up, choosing to continue to grieve or sulk eternally. Neither approach delivers peace. But giving in does. This doesn’t mean you must not contest. That you must not compete. That you must not take up the leadership of a situation or run a race. But whenever the sporting spirit is lost, and acrimony is beginning to set in, or as in the Pope’s case, when you are no longer able to create value, clinging on, even if something legitimately belongs or is due to you, is pointless. Letting go or walking away or giving in is not an act of cowardice. It is the most intelligent way to restore peace and equanimity, allowing all parties, including you, the time and space to think things over, sort themselves out and reflect on the learnings without any angst or animosity or fear of losing! Author AVIS ViswanathanPosted on February 25, 2013 March 14, 2016 Categories Arjun Rampal, Art of Living, Give In, Give Up, Grief, http://schemas.google.com/blogger/2008/kind#post, Inkaar, Inner Peace, Intelligent Living, Letting Go, Pope Benedict XVI, Sudhir Misra, Walking AwayLeave a comment on Letting go or walking away is not always giving up!